Using the symbolism of the lion as well as the man and woman that are featured on The Two of Cups card, it becomes clear that in a lot of ways, the two of cups is actually the equivalent to the lovers card in the major arcana. The looks that the two share can convey tension and this makes them want to seal their union. In a more abstract sense that does not apply to relationships, this can merely represent the union of two people or entities, even two ideas. 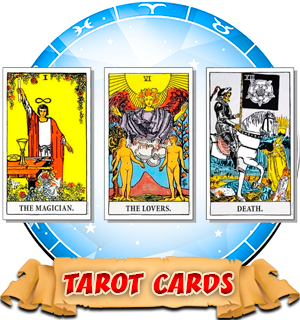 However, it is preferable for people to receive this as their love fortune when they are having their tarot readings. When this card appears as the love fortune in a tarot reading, it can mean several things that all depend on what state you are at in your relationship currently. If you are already well acquainted with your lover and have been with them for a long time, then this can actually be a card of warning. It will mean that you will become closer with the passage of time, but this closeness can create an exclusionary barrier around you and lead to many friends and family feeling alienated from your group. Try not to exclude people based on what you see here. On the other hand if you are just beginning a relationship, this means you will become very close in a short amount of time, and in a very good way. Finally, when you get this card and are not in a relationship at all, it usually means you will cross paths with a very seductive person soon. When this card is meant for your career fortune, it can mean something such as the combining of two strategies or ideas to get your business to run more efficiently. If you want to make everyone in your work happy, you are going to need to be able to combine strategies. If you are not the big boss, but are working on an important project which could potentially mean a lot of positive publicity from your superiors, then you will probably have to try to see what you can do with the opinions of others. It may not be as glamorous or impressive when you ask for others help, but it may be what will lead you to success in the end. Seeing the two of cups card for your money fortune usually means that you are going to need to combine money sources soon. This usually applies to people that are in relationships together. If you share expenses, you might as well share money too. Don’t be afraid to give some of your money to your partner and let them use it how they see fit and do not be afraid to ask either. The accumulation of two sources of income together can lead to great profit and even wealth in the future. When this card makes up the fortune for health and happiness, it usually means that you are going to find the most happiness through relying on your lover. You have become so close that the two of you are almost inseparable and they feel like an extension of you. You will make yourself happy by making him or her happy. Try doing more things that they are interested in or that they want to do.